“How about we settle down and just focus on a simple post – we could wrap up our series on stickers.” Rarely does Ridicu agree with the moderate approach, but he sees the merit of focusing on basic information to smooth out our psyche before this afternoon’s Georgia Raid. Everyone agrees that should we continue on we will likely continue suffering abstract distractions. Turning back when it is least expected and striking quickly seems the best option (Skunks are almost always napping in the afternoon). The two parking stickers above the Great Loop Moto sticker must be forgotten…..RidicuRyder’s anonymity must be maintained other wise HW will get pissed off and we probably won’t be able to keep Blogging (there are plenty of Male Nurse Motorcyclists in Miami who wear Tasmanian Devil helmets….if you must speculate on our identity – choose one of those guys). Great Loop Moto: came with Mr Fandango – we give it a 7.3 on our RR rating scale. Now we have all sorts of weakness’ when it comes to women – this young lady had two of our top three: small breasts and a lazy eye. The third and most irresistible feature is a lisp – they kill us. Luckily a unibrow doesn’t quite make our top 17 7/8 ….if it did we would have signed without another thought. Instead we both said “how about we make a one time anonymous donation?” Basically we sort of feel like equality has to be balanced with inequality and indifference, we peeled $5 out of our wallet….enough for a veggie wrap (almost lunch time) and just right for keeping our gmail inbox fit and trim. Big smiles, we were backing away when she added “don’t you want a sticker?” Then to my horror she began holding the sticker up against Kimmie Lou in different places! “Great, uh thanks ….we’ll have to think about a good spot for it then make sure it is nice and clean so it sticks well.” Walking away ” you aren’t serious about actually putting that thing on right? I mean c’mon we are going to be kicking around the south for the summer….it might attract the wrong kind of attention.” After a few steps “think of it this way….if Kimmie Lou has this sticker on – anyone messing with her will be committing a hate crime. Besides, it’s probably time we came out and told the world we are a lesbian trapped in a man’s body….don cha think?” Well, I had to admit it…the unibrow was oddly alluring. TOUCHÉ: around a decade or more ago there was this big movement to reduce waste by pressuring companies to go green and put their products in smaller packages. For a while there you would buy a watch battery and it would just barely fit in your shopping cart diagonally because everybody manufacturing anything had a brother-in-law doing their packaging. This is the way we feel about the Touratech sticker, Lefty Ortlieb tells us Touratech makes their stickers huge as a Zega-ionist conspiracy to put hard panniers on every motorcycle in the world (basically, the only place for a sticker this huge would be a hard saddlebag). Righty O has barely spoken to any of us since Kimmie Lou offered that Gator a bite of him back in South Florida, but he did corroborate Lefty O’s take on the situation. 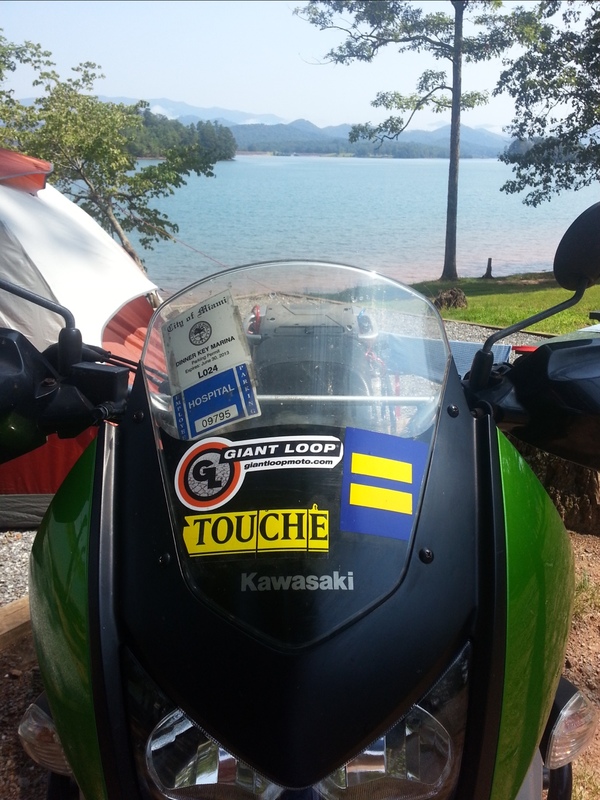 Ridicu has that tic where we have to poke large folks, corporations, foreign governments and Martians with Death Rays so he decided to cut the Touratech sticker down to size. Tags: Equality, Futility, Georgia Raid, Martian Death Ray, Psyche Smoothing, Skunks: Napping Habits - a case study, stickers, Touché, Touratech | Permalink. I love the modification of TOURATECH into TOUCHE. You are a genius!